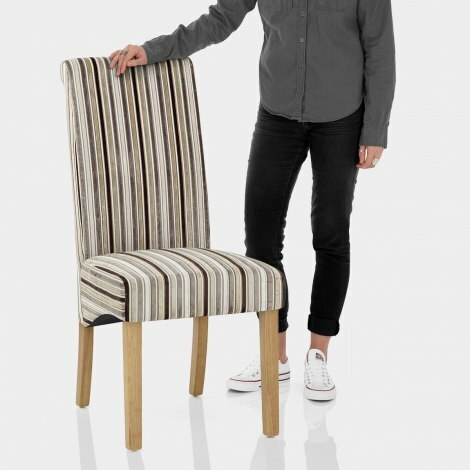 Revel in the Roma Dining Chair Oak & Stripe, an astounding scroll back model with many desirable and comfortable features. 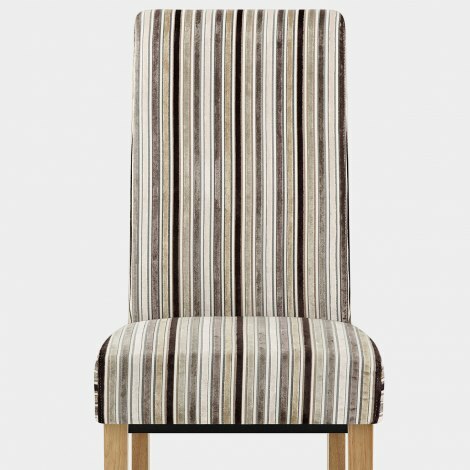 Crafted using a velvet striped fabric, it combines comfort with an angular look, making it at once eye-catching and neutral. The high backrest invites you to sit back and relax, and is sure to prompt compliments from friends, while the accompanying padded seat provides support in a sophisticated manner. This elegant design rests on four solid oak legs, making it a great addition to any surface. The Roma also has protective plugs so it will thrive on all your surfaces in addition to making a tasteful statement in any location. "Great quality chairs that were delivered the next day"
Excellent service and very pleased with my order Will definitely use Atlantic shopping again. Very pleased with my new chairs great quality and comfortable. Very good lovely chairs nice colours, comfy to sit on. Very pleased with these Roma chairs. They look much more expensive than they were. Excellent value for money. Easy to assemble and comfortable. If you are thinking of buying them then don't hesitate as you won't be dissappointed. Really pleased with product, prompt and efficient service, easy to put together and good quality. Would recommend.